Cities are leveraging transit systems to spark higher-density, people-centric growth. Above: Passengers arrive at Denver International Airport’s Transit Center from the A Line that links the airport to downtown Denver. Image © Scott Frances. In the first decades of the 20th century, many cities built their first mass transit systems, encouraging communities to grow up around the stations. The postwar Car Age broke this pattern. The sprawl that followed gave rise to long commutes, traffic congestion and gridlock, and air pollution. Today, many cities are adding to their transit networks. As they do so, they’re partnering with the private sector to share the cost and increase transit’s community benefits. Many of these same cities are asking how earlier, transit-led strategies of growth can be revived and applied in a 21st-century context. Using transit hubs and stations as the catalyst, they are locating new walkable developments right at transit’s door. The scale and density vary, but all of them are building on the armature for future growth created by renewed city and regional investments in transit networks. This two-pronged strategy, leveraging public-sector investment to secure the growth that maximizes transit’s impact, is proving itself on a global basis. Los Angeles and Denver are far enough along in implementing the strategy to show tangible results, while Leeds and Bogotá are embracing it as part of ambitious plans for their cities. Each demonstrates how the strategy is the model other cities will follow. Glodney and his colleagues are working with the Los Angeles County Metropolitan Transportation Authority (Metro) to put these ideas into practice. The work follows a November 2016 vote supporting a tax measure that will generate up to $120 billion in transportation investment in LA over the next 40 years. Those plans include bringing Metro rail service to LAX. Martin Expo Town Center was sparked by LA Metro’s Expo Line extension to Santa Monica. Image © Gensler. LA Forward envisions how transit networks can be leveraged to improve quality of life. Ease and choice of movement makes cities flow. Urban-scale solutions keep pace with rapid growth. Diverse economies support a network of growth and opportunity for residents and business. Embedded technology enriches lives by connecting people, transit, buildings, and urban systems. Infrastructure that responds to environmental and man-made challenges is key to a sustainable future. Locating people, goods, and services at higher densities close to transit options supports community and equity—and limits sprawl. By embracing a mix of housing and economic opportunities, while celebrating diversity, cities enjoy a rich vitality. When people are active, their health improves. Walkable, bikeable, active communities have lower healthcare costs. As it expands its lines and adds stations, Metro purchases land along its routes to stage construction and launch tunnel-boring machines. This creates opportunities for walkable mixed-use development around the new stations—an effort that was given renewed impetus by the defeat in March of Measure S, a ballot measure advocated by slow-growth proponents to curtail new construction in the county. Now it’s full steam ahead. 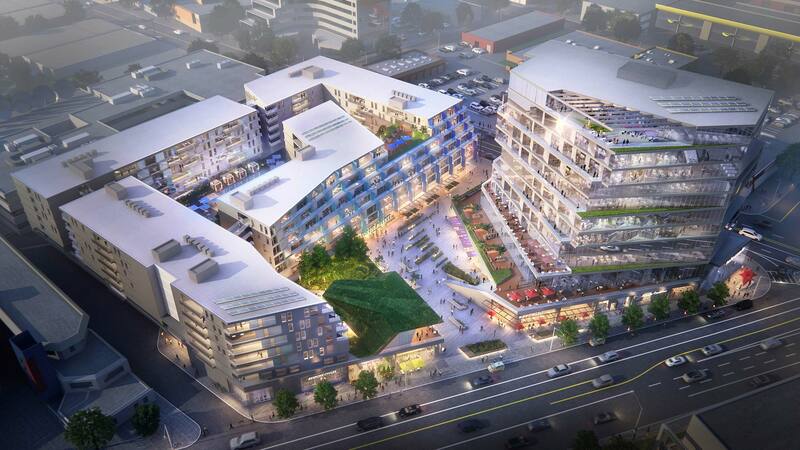 One project that’s gained momentum is NoHo Nexus in North Hollywood, 15 acres of housing, retail, and office space that adjoins the North Hollywood Metro Station, where both the Red Line subway and the Orange Line bus rapid transit route meet. New sidewalks and bike paths close existing gaps in circulation networks, creating a walkable district that surrounds an open-air market and gathering place for residents and commuters. The Expo Line’s extension completes the connection from downtown to Santa Monica. As part of its long-term effort to build a comprehensive transportation network in Los Angeles County, Metro opened the 6.6-mile extension of the Expo Line in 2016, completing a rail link between downtown LA and Santa Monica. Making the communities in between more accessible as places to shop, live, and work is stimulating growth, with a wave of projects popping up near the new stations. At Metro’s Expo/Bundy Station, for example, the 800,000-square-foot Martin Expo Town Center will combine creative offices, apartments, and retail on the site of a former car dealership. To make it walkable, passages will cut through the site to a central retail plaza. To make it diverse, 20 percent of the on-site housing will be affordably priced. Transit expansion is also transforming Denver, where the recently opened, 23-mile-long University of Colorado A Line connects the city’s downtown district with Denver International Airport (DEN). 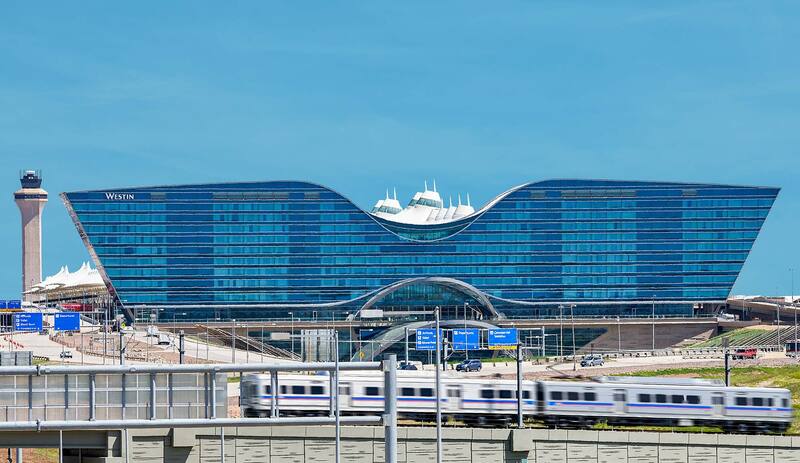 A new transit center at the airport anchors a city-accessible meeting venue with a new Westin Hotel and restaurants. Its public plaza attracts tourists and residents alike to putt-putt events, the Beer Flights beer garden, ice-skating, and other Colorado-themed activities. Along the A Line, the Giambrocco project adds retail, offices, and a boutique hotel to Denver’s RiNo District. Image © Gensler. The DEN Westin Hotel is a new destination in the city. Image © Gensler/ Ryan Gobuty. Six new stations along the A Line are centers for urban growth. Mather and his team are involved in two mixed-use projects there. In sync with the neighborhood vibe, the larger one—known as Giambrocco—includes creative offices and pop-up studio spaces for artists and entrepreneurs. It’s forward-looking too, with garage levels that are designed for easy conversion to working or living space as automobile use and the demand for parking taper off. In the UK, a planning team is applying a similar two-pronged transit/livable center strategy to the Northern Powerhouse, a “super-region” and east-west transit corridor that takes in the cities of Liverpool, Manchester, Leeds, Sheffield, and Hull. The impetus is the HS3 rail line, upgrading the corridor to high-speed rail and linking it southward to Birmingham with an extension of HS2. High-speed rail connectivity among these cities will make it easier for their labor markets to flex. It will also encourage private investment in the urban centers that plan the infrastructure improvements in ways that enhance their communities. “When major investors look to the Northern Powerhouse, they are interested not only in cities with growth potential, but also in cities that embrace the essential elements of a vibrant community—connected, resilient, inspiring, and healthy,” says Hiro Aso. The Northern Powerhouse has 10.7 million people, including 16 percent of the UK workforce. By connecting its ports, airports, city centers, and 21 major universities with high-speed rail and developing the area surrounding each transit station along the route, its economy is expected to grow 15 percent by 2050, adding 850,000 more jobs than the cities would without this investment. The area south of the Leeds Transit Hub is ripe for close-in redevelopment that will extend the city center. Image © Gensler. 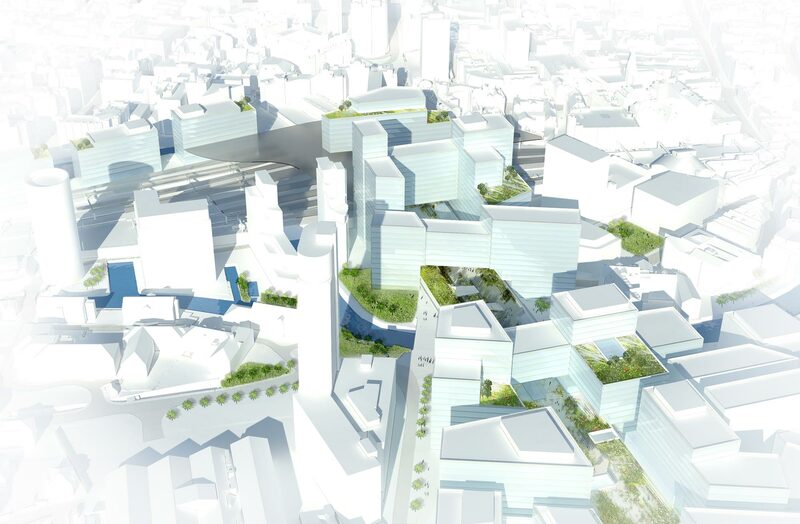 A vision for mixed-use development clustered around the new HS2 rail connection in Leeds. Image © Gensler. 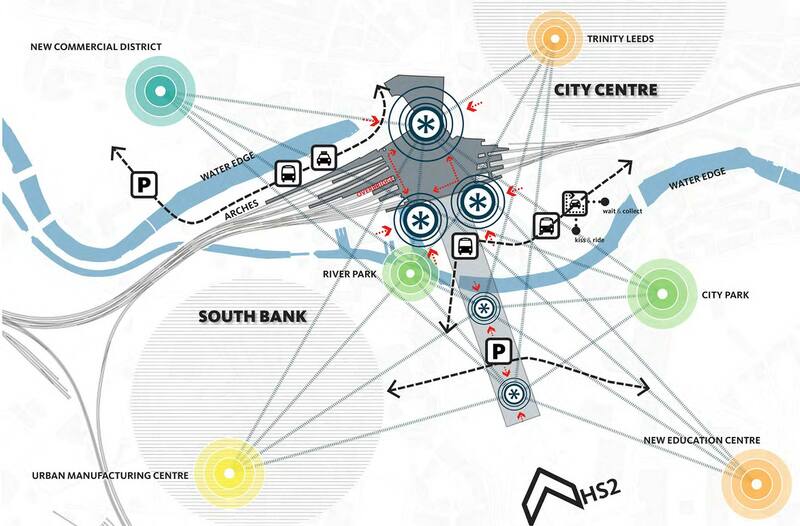 Part of the initiative is a new transit hub in Leeds, a key stop along HS3 and the connecting point with HS2. Currently, elevated railway tracks and the River Aire create barriers between the vibrant retail scene to the north and a desolate sea of parking to the south. The new transit center will bridge the gap. 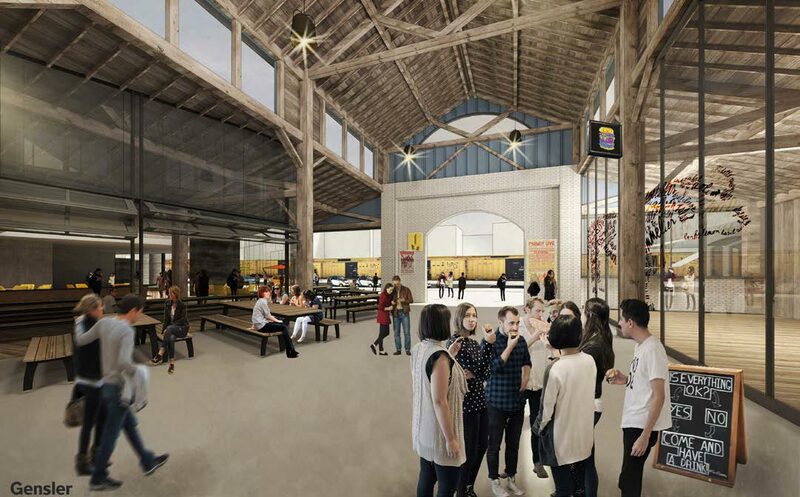 It will bring the brick arches under the tracks alive with shops and restaurants; restore green space along the river; and serve an expanded urban center, adding some 2 million square feet of mixed commercial uses. In addition, the transit hub will complement wide-ranging urban improvements called for by the South Bank Leeds Framework Plan, including better roads and bus service, new bike routes, an upgraded riverfront, and a new city park that will tie South Leeds to the traditional city center. Leeds expects to double its population in the next 20 years. These new enhancements will help absorb that growth and bring people back to the heart of the city to live and work—directly served by intercity high-speed rail. Bus rapid transit (BRT) systems can be found in more than 69 Latin American cities, a mass transit strategy that both precedes and augments rail-based systems. In Bogotá, the future vision of a new mixed-use district is tied to the ability of the city’s heavily used BRT network, TransMilenio, to pull in a regional audience. The Corferias 2030 Plan leverages the synergies of two crowd-generating facilities—the Corferias exhibition complex and a new convention center—to create a new events, conventions, and fairs district near Bogotá’s commercial center. 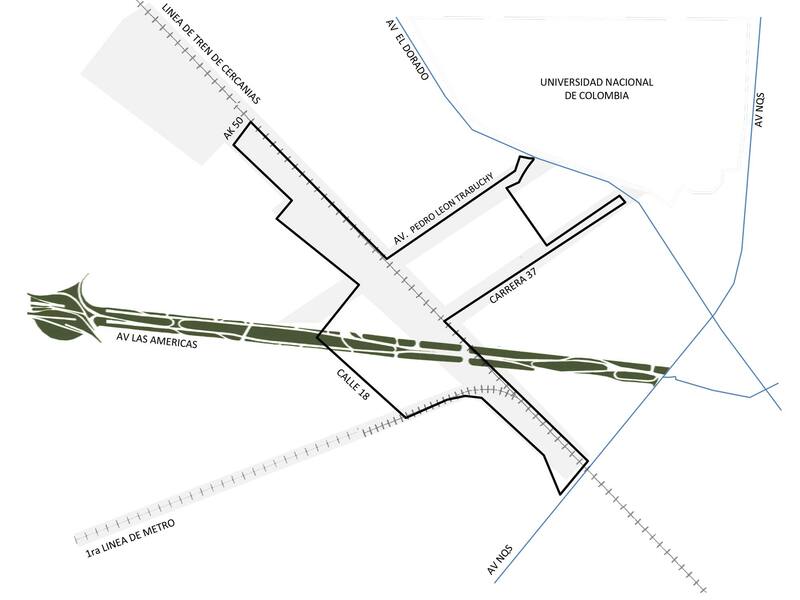 The district will be served by two new TransMilenio routes, and by a new Metro station along a proposed rail line that will pass through the development, connecting the city and adjacent municipalities. Bogotá will transform the Corferias district with walkable, transit-served development clustered around public parks and plazas. Image © Gensler. “Corferias is the hinge between the various sections of the city,” says Carlos Cubillos. “Yet, because it’s hemmed in by industrial buildings and substandard housing, it’s been overlooked.” The 2030 Plan includes a large new central plaza as a focal point for public events and cultural celebrations, ringed by offices, housing, and a Hilton hotel. This development is part of the INOBO innovation strategy for Bogotá, which will add 5,700 new high-paying jobs. Community activity and access will be encouraged by smaller parks, linked by walkways, that provide other gathering places. “Permeability is important in an area that was so isolated,” Cubillos says. Tying the new district to the city’s bicycle network, one of the world’s most extensive, reinforces the plan’s commitment to environmental sustainability. The Corferias district will connect to the region via rail and bus rapid transit networks. In focusing private development on the communities served by existing and expanded transit networks—encouraging private investment in tomorrow’s transit-served urban centers—cities and regions are boosting the returns on their public, taxpayer-backed investments in transit infrastructure. It’s a true double-win, a two-pronged strategy for growth that’s already showing its value. Vernon Mays is a senior writer/editor with Gensler Communications.